I am about to make a cut and ask your permission. As a kid, I planted saplings around the house. The pin oaks today are now 70-90 feet tall, and my mom lives surrounded by a forest. It’s reverant. So I am not in the habit of cutting trees; I plant them. 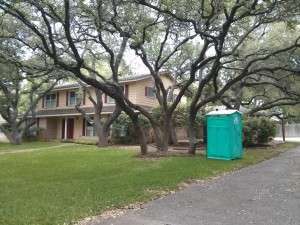 But we have to cut clearance to get the dumpster up to the house, to begin the remodel. Which pains, because we bought this house, in part, for the forest of trees it inhabits. Here’s an example of why. 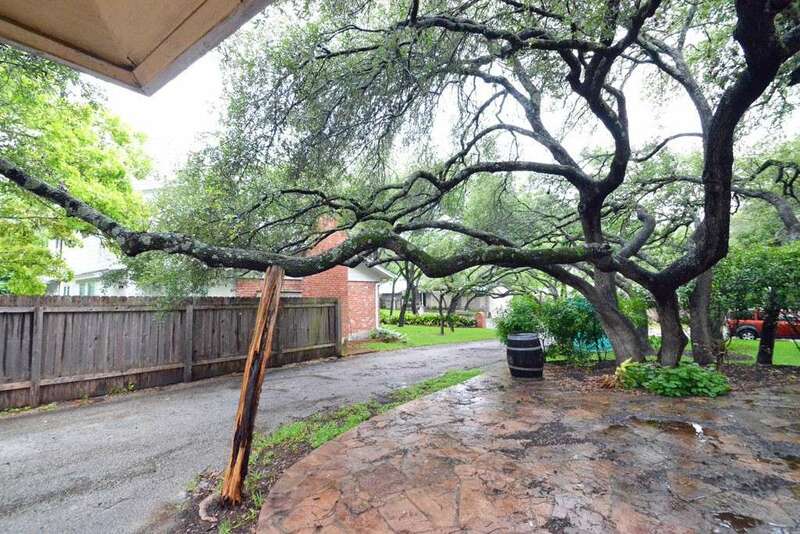 This limb extends 30 feet out over the patio and driveway, five to six feet off the ground, held up by a vertical post, and then up and over part of the garage. It’s your skull — or a thwacking. They can’t deliver the dumpster with that in the way. Our goal is to trim, not destroy. 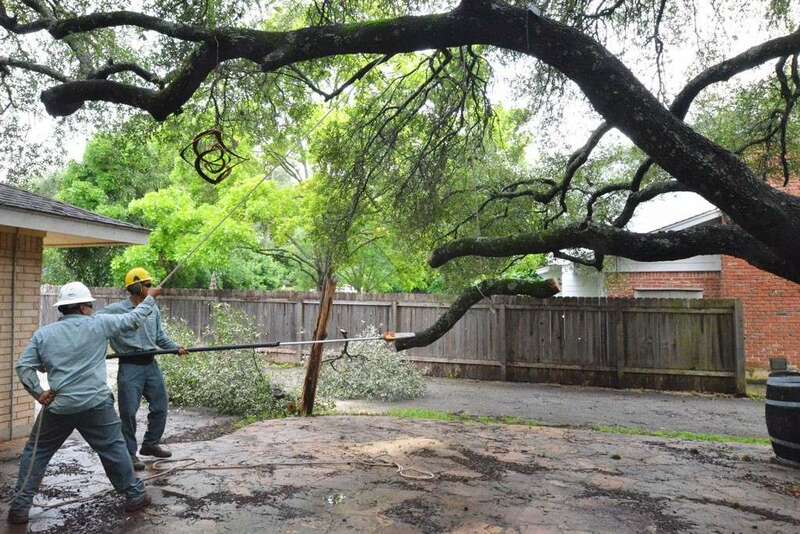 Ranserve recommended Davey Tree, a certified arborist — a City of Austin requirement. Jeff Cisneros came out, walked the lot with us, showed us what he recommended cutting in phase 1, to make way for the dumpster, and in phase 2, to remove branches that hang over the roof, for safety. 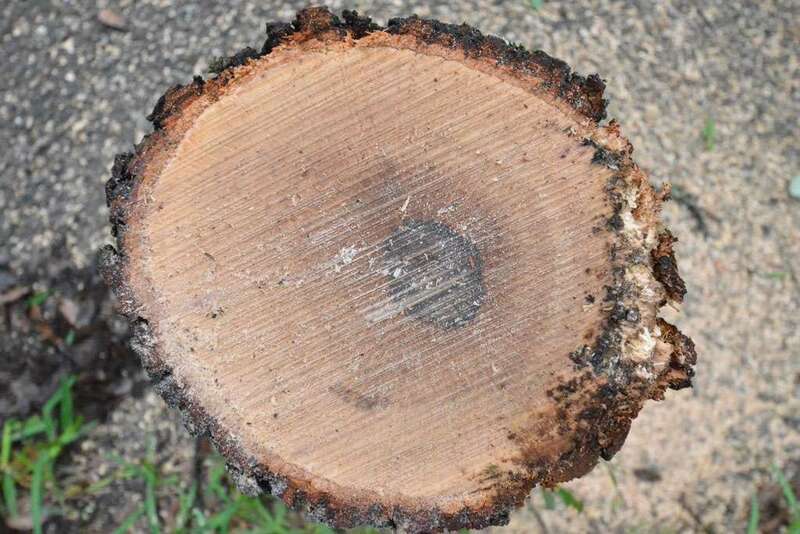 Along the way, we learned there is an American Elm in the back yard. That’s opening a Cracker Jack box to find a prize. Meet — from Davey — Miguel, left, cutting, and Luis, right, about to drag a limb to the chipper. 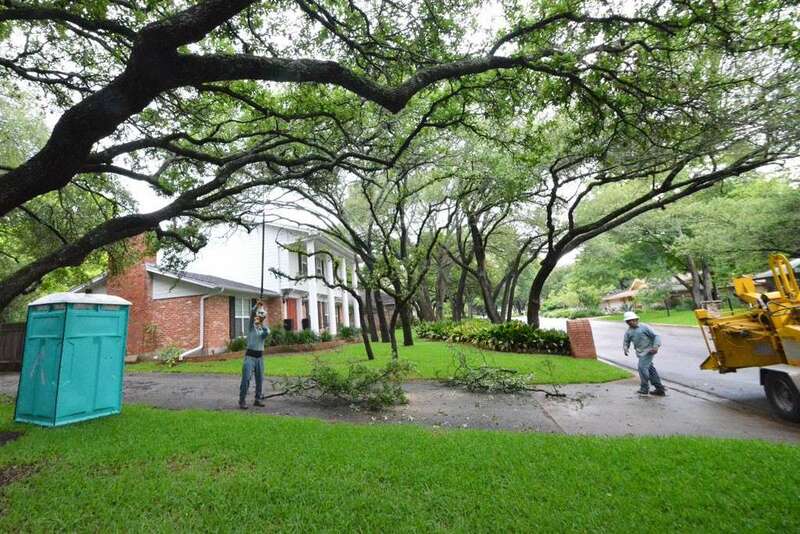 Here’s what it looked like taking down the limb that extends over the deck and driveway. That’s an eight-foot chunk of limb hanging by rope. Count the rings. 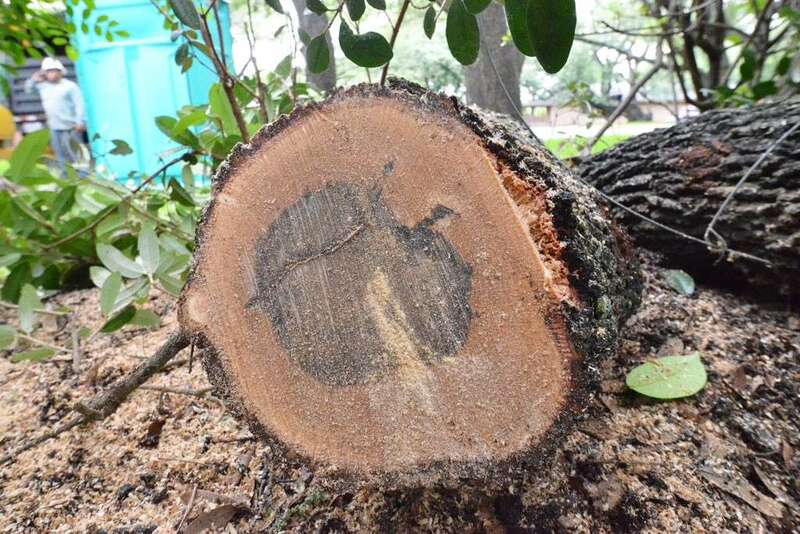 Miguel thinks the oak is at least 50 years old. 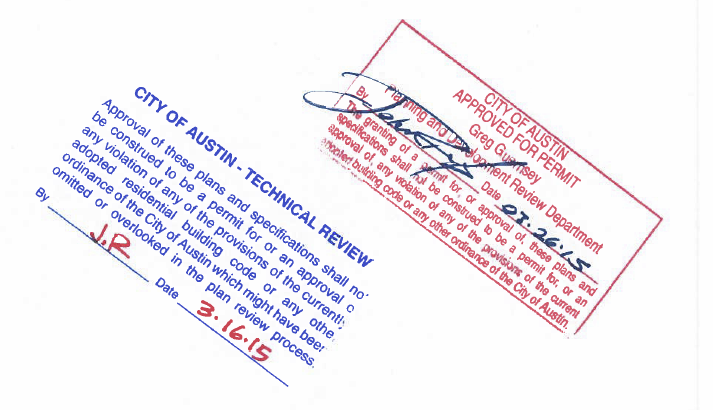 And a giant leap forward toward demo. Meeting at Ranserve to review and revise construction plans and projected budget. Everyone left with homework to do. 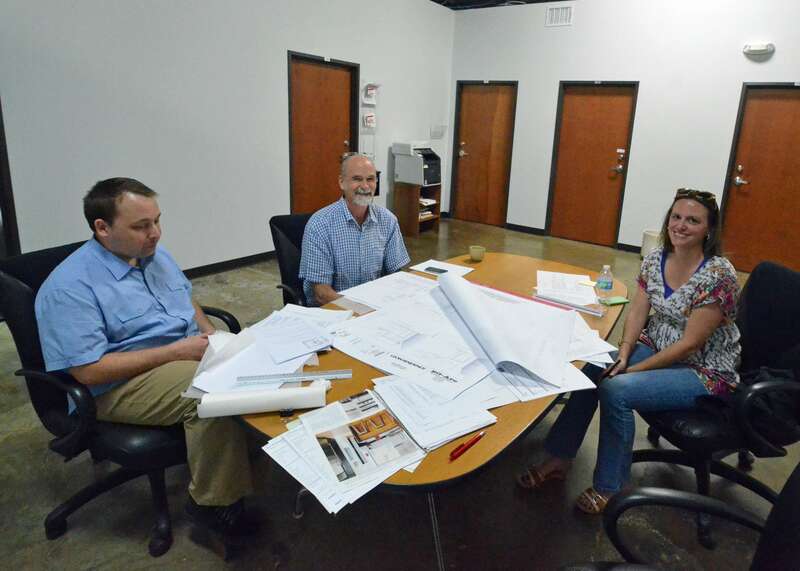 From left, Brett Grinkmeyer, architect; Mark Rehburg, president of Ranserve; Michelle Hastings, estimator and budget whip at Ranserve. 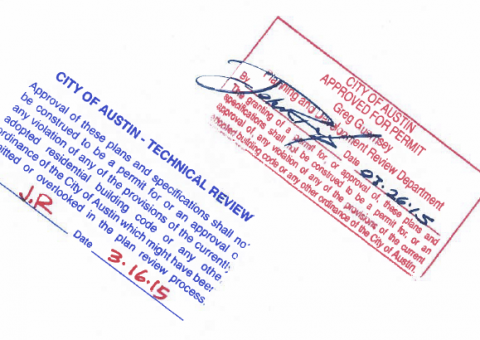 The City of Austin today approved demo and remodeling permits. Yay! 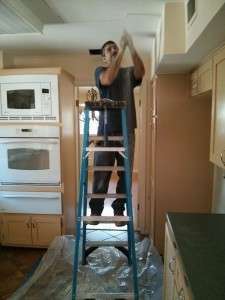 Chris from Ranserve cuts a hole in the kitchen ceiling as we attempt to answer the question — how is Emerald Hill put together? 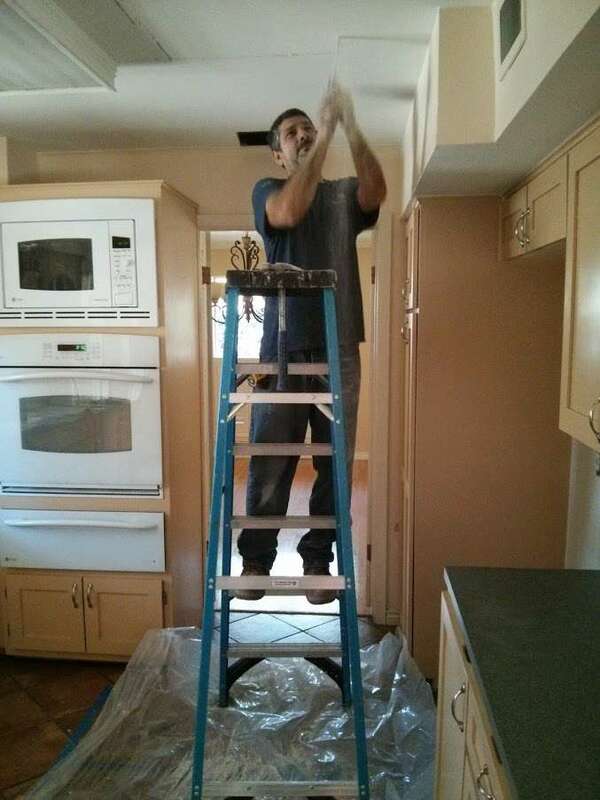 One answer — the ceiling beams are 2x10s.